Steve Lillyston and his wife Anne have lived on Udy St for three years, having owned a property there which they previously rented out for 10 more. Over the years they’ve come to know the breeding pair of ducks which live at the bottom of the road quite well, eagerly anticipating the arrival of their ducklings each year. “They come back every year,” he said. On Monday he saw that a “silly sign with a yellow triangle and a black duck with no words” had been placed at either end of the street. He was unsure why the sign had been put up and what its purpose was. “Is there a gigantic duck on the loose? Are ducks for sale nearby? Is it duck awareness week? Anne agreed and questioned the council spending $120 to erect the two signs. “It’s a waste of money,” she said. Lillyston said he wondered why signs weren’t put up for children and other animals along the street, including cats, dogs, assorted birds, and rabbits. He said the side street was scarcely used and most neighbours knew to take care nearer to the breeding season. 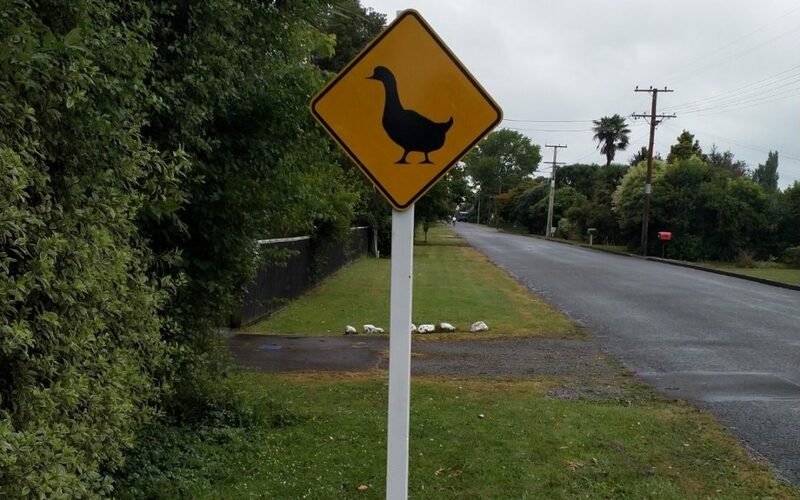 South Wairarapa District Council manager of infrastructure services Mark Allingham said the signs had been put up in response to requests from two residents who had reported several duck and duckling sightings at the spot, including those that had fallen victim to traffic or dogs. It wasn’t standard practice to contact residents when putting up warning signs within a road reserve and council had not received any negative feedback about the sign, he said.